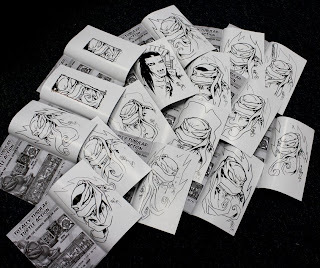 Peter Laird's TMNT blog: One hundred and twenty-five down, seventy-five left to go! I orded one from Eric this time round and boy oh boy I hope I get that casey one! And we seriously need to see him do at least one issue of the comic befor eyears end! Those are nice looking, he really has a unique take on them. Oh boy, my wife is going to kill me. -->> ..well holy shmolians !! Oh boy, my wife is going to kill me.-->> Why ?? Wow!! Really glad I requested a sketch by Eric. Very Nice. Those look incredible. The Casey one is awesome! What a cool surprise for the person who happens to get that one! Because after seeing these bad boys, I got some more ordering to do!! There goes that romantic, Saturday night dinner at Le petite Orangé !! Vaughn is right, we need eric to do a tmnt issue! You guys must be tired! Enjoy your weekend. Holy Hipo Spit! What's amazing!! But how about Dan's sketches? Can we see them? I ordered one of Eric's as well. It's cool to see how much variety there is in his sketches. I think that just makes it that much more special to know how unique each is. Really wish I could have gotten in on these. That's twice I've missed these. Curse me for writing down the wrong dates. Please do this on the next issue! It's so awesome! I must score one of these.